This summer, four brave and lovely young adult authors embarked on a grand quest: road trip across the United States to hold workshops for young, aspiring writers. 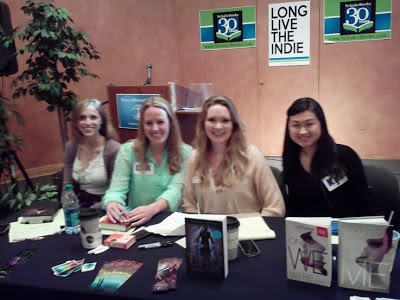 The authors were Sarah J. Maas (my writing idol and author of Throne of Glass), Susan Dennard (author of Something Strange and Deadly), Erin Bowman (author of Taken), and Kat Zhang (author of What's Left of Me). I was flabbergasted and amazed that I got to go. Author tours don't usually hit my area, so it was like a dream come true. Not to mention, these are all authors of books I either already love or have been dying to read. They're authors whose careers I've been following on the blogosphere. I spent the car ride there in a giddy stupor and nearly died when, as I waited with my computer in the back of the bookstore, Susan Dennard passed me. Then nearly died again when Sarah recognized me from Sarcasm and Lemons. Then again when Susan and I bonded over the unnecessary presence of Tom Bombadill while waiting for the cafe. It was seriously one of the best days I've had, and one of the most inspiring steps in my writing career. Didn't get to go? Here are some highlights from the queens of YA. Keep in mind that these are from my notes. Ask why questions. Why is the world this way? Why would this character do this thing? Use what you know to ground fiction in reality. That means you can write outside of what you know--because somewhere, you have an experience that can relate. Listen to inspiration music. People watch. Read great books. Try writing freeform. Or, try an outline. Write out the whole chain of events or pick a few big ones and write around them. Try a bunch and see what works for you. Set goals you can control. I will submit to 10 agents, not I will get 10 requests for fulls. Find a critique partner who works for you and will do the level of critique you want. Trade a few pages first and see if you're a good fit for each other. Carve out writing time, no matter what. Practice writing pitches. And synopses. And check out Susan Dennard's fantastic guide for help. Don't query all your favorites at once. Try some and then rework the query if it's not working. Always be working on something. While you're querying one project, be writing the next. Stop comparing yourself to other writers. You're unique. That's a good thing. Wonder what they like to read? Some of their most loved authors and YA books. Because I asked, and they have good taste. This event sounds so cool! I'm glad you got to go and share it with us! I'm not planning on being a writer, but reading their advice is interesting to get a look at their writing process and how they craft such great books! It was amazing! It was definitely really cool to see where their ideas came from and how they got to their final books. Announcement: I'm out of hiding!